A little bit of leopard is all a gal needs to take a walk on the wild side. Whether it be over-sized or box shaped, suede or ponyhair, a leopard-print clutch is what I'll be carrying come date night. 1, Charlotte Olympia Pandora Classic Persplex Clutch 2. Christian Louboutin Alina Leopard-Print Calf Hair Clutch; 3. Clare Vivier Leopard Foldover Clutch ;. 4. Diane von Furstenberg Lytton Spotted Haircalf Clutch 5. Jerome Dreyfuss Popoche Large Leopard-Print Pony Hair Clutch 6. Jil Sander Ponyhair Envelope Clutch; 7. Alexander McQueen Skull ocelot-print calf hair box clutch. OMG! Love all of them! Nice! I love 3 & 5! Looove the Claire Vivier and Alexander McQueen clutches. Crazy, catty, cute. Not to mention, leopard print goes with just about anything! I love all of these bags! I love how leopard print basically goes with everything. Ohhh, love this post! 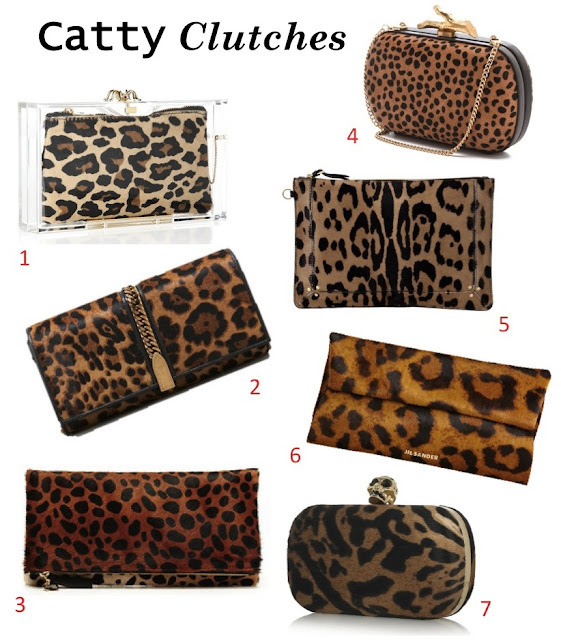 I don't own a leopard clutch...hmmm...can you say fall purchase? Loving that DVF one! LOVE # 1 and #7! love those clutches <3 so cute! that charlotte olympia is making some very cheeky stuff. I love animal print accessories- I think it is the perfect place for them! Love animal print ! Nice blog ! Love these, esp the Alexander McQueen! Love it, obsessed with leopard! ADORABLE! I'd totally rock any one of them - especially number 7! Thank you for stopping by my blog :). I followed you back on bloglovin and google. I love everything leopard print as much as cheetah print! I am not a big fan of animal print in clothes but I can totally rock a animal print shoe or clutch! I love these clutches! I love to accessorize with leopard. I basically buy everything I see in animal print! Love these!